It helps to be able to take people to the ground. Even if you're a great striker, you might encounter someone better. Why slug it out when you can just drop the guy on his head and then submit him. If your strategy IS in fact to remain on your feet, you still need to learn how to wrestle. You need to remain on your feet in order to strike someone, right? Learning a few wrestling fundamentals allows YOU to control where the fight goes. 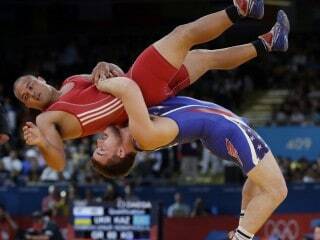 This is a tricky way to set someone up for a double leg takedown. If you aren't a great wrestler, this is a good way to start the process of getting your opponent on the ground. This is a tricky takedown that ends up smashing the back of somebody’s head into the ground. If you do this on the wrong surface, someone could end up with brain injury or worse, so don’t say I didn’t warn you. Also, we end up on a Tangent about the time when Christian Bale freaked the F out on the set of Batman… Good times.